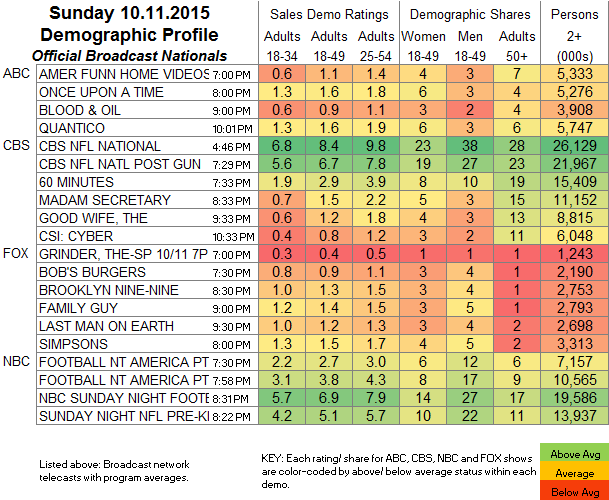 NETWORK UPDATE: SUNDAY NIGHT FOOTBALL adjusted up to 6.9 in final numbers, far below last week’s 8.7. For whatever it’s worth, BLOOD & OIL gained 0.1. Everything on CBS was adjusted by 0.1: down for 60 MINUTES and CSI: CYBER, up for MADAM SECRETARY and THE GOOD WIFE. On FOX, the football-inflated GRINDER rerun lost half a point, then BOB’S BURGERS was down 0.1 and THE LAST MAN ON EARTH gained the same. CABLE HIGHLIGHTS: While still gigantic, AMC’s THE WALKING DEAD returned down 1.22 from last fall’s premiere to 7.43–still enough to beat everything on TV including SUNDAY NIGHT FOOTBALL. Correspondingly, TALKING DEAD lost 0.60 to 2.90. On VH1, BASKETBALL WIVES rose 0.15 to 0.93. E!’s KEEPING UP WITH THE KARDASHIANS was up 0.05 to 0.82, DASH DOLLS lost a tick to 0.22, and HOUSE OF DVF rose 0.03 to 0.15. On Discovery, ALASKA THE LAST FRONTIER dropped 0.12 to 0.62, and NAKED & AFRAID fell 0.04 to 0.53. Food Network’s HALLOWEEN WARS dropped 0.15 to 0.50, and CUTTHROAT KITCHEN was also down 0.15 to 0.42, with GUY’S GROCERY GAMES down 0.05 to 0.41. 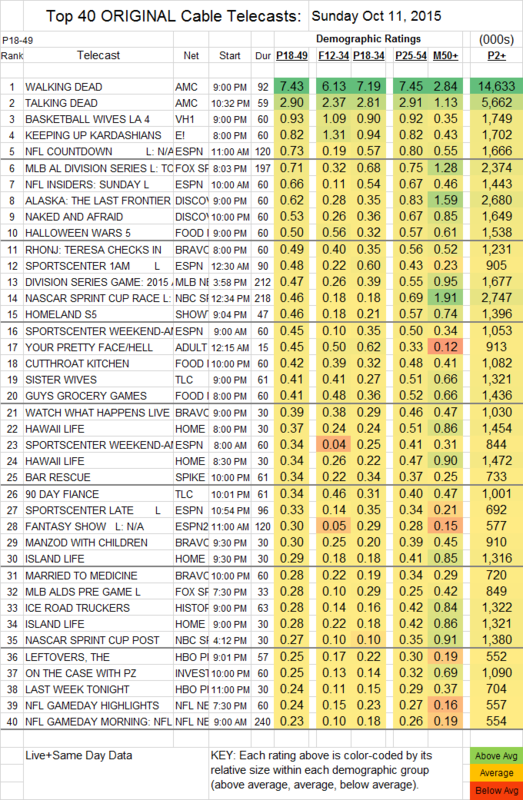 Bravo’s REAL HOUSEWIVES OF NEW JERSEY spin-off was at 0.49, while MANZOD WITH CHILDREN was up 0.02 to 0.32 and MARRIED TO MEDICINE fell 0.24 to 0.28. Showtime won the paycable wars by virtue of HOMELAND, down a tenth from last week’s season premiere to 0.46, while THE AFFAIR lost 0.03 to 0.15. On HBO, THE LEFTOVERS dropped 0.08 to 0.25, with PROJECT GREENLIGHT down 0.08 to 0.07 (141K total viewers), DOLL & EM steady in the demo at 0.03 but down to 89K total viewers, and LAST WEEK TONIGHT down 0.04 to 0.24. Adult Swim’s YOUR PRETTY FACE fell 0.03 to 0.45. History’s ICE ROAD TRUCKERS dropped 0.11 to 0.28.